I was not raised in a religious home (unless you count praying over dinner to be religious). I don’t recall having many, if any, conversations about religion with my parents when I was a child. I went to maybe two or three Catholic Masses with my grandparents (not of my own volition). I had no idea what was going on during these services. Moreover, I’ve never really had a “religious” experience, that I can recall except a minor one a few months ago. I’ve believed in God as long as I could remember, although my definition and concept has not always been clear, consistent, or obvious to me. When I was younger I reeled at the concept of God, not quite understanding His nature fully (perhaps from some terrible definitions and explanations given by my parents and others). I also found myself dumbfounded at the possibility of the universe being infinite in volume (extending in each direction forever), and also the fact that I would cease to be (I was about 8 years old, for reference). So, I’ve always been curious and interested in deeper “philosophical” issues. My parents were not much help in consoling me over the latter concern of death. When I was about 16 years old, my cousin and my best friend, nearly around the same time, introduced me to Christianity. Up until then, I had a shallow and passing knowledge of it. I had many questions, and although I was persuaded by some of what they told me, I couldn’t reconcile some of the ideas with what I had been taught, or with my intuitions, and my skeptical nature inclined me to take everything with a grain of salt. Eventually I read the Bible (a bit), and went to church a few times with my best friend. I remember a moment in his church where the pastor told those who hadn’t put their faith in Christ to make a commitment, and I remember praying that prayer. Honestly, I’m not sure I fully understood the implications of what I was doing, or what it meant. I knew that I wanted a “relationship” with God, but in retrospect only in some selfish way that may not have had much to do with Jesus. So I had a weak faith from the start. I remember re”committing” myself when I went to a church-sponsored event where the pastor made a similar request for those who were not Christians to make a prayer. That time, I feel like I meant it more and understood more fully what it meant. Yet, I couldn’t get myself to change my habits, start reading the Bible, or go to church. 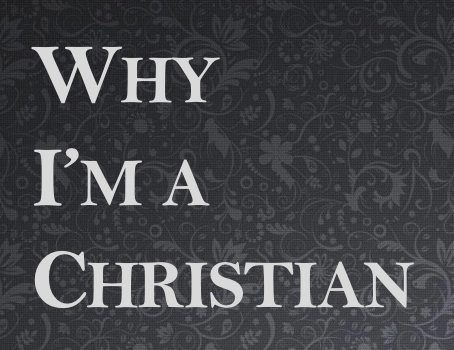 I wanted to live my own way, and my Christianity was only a small influence on lesser matters. Eventually, later in high school I began to seriously doubt my faith, but I never doubted God’s existence – at least I didn’t for very long, and only as an exercise (I remember reading a Stephen Hawking book and just thinking the whole time that his cosmology was simply affirming more deeply my belief in God). I was able to quell my doubts sufficiently enough to subdue them. Well, Freshman year of college came along and I took a philosophy course. My doubts resurfaced over my faith (in everything, really). I started to think about these things more and do some online research into apologetics. There were two things that I couldn’t square with an atheistic universe. The first thing was the existence of objective moral values. The more I thought about it, the more absurd it seemed that there could be objective moral values and duties without an ontological grounding in God. I knew also I couldn’t live consistently with the belief that they didn’t exist. The second thing was the laws of logic. I saw no reason that these necessarily exist in an atheistic universe (it turns out a crude argument from the laws of logic to the existence of God has recently been made in Philosophia Christi by James N. Anderson and Greg Welty). So for a brief period of time I decided I’d be a deist. It was a safe worldview. I could have the benefit of believing in God, without that religion stuff, and that interference in my lifestyle on the part of God. What did he care about me, anyway? Well, not too long afterwards I thought about it more and realized that if there was a God who created the universe and had foreknowledge of everything that would happen, then he couldn’t possibly not care about humanity. I turned back to Christianity as a starting point, because it was really the only reasonable theistic account that I knew of. Around this time some troubling or cloudy aspects of the Bible became more clear to me and helped reaffirm my faith (one example is the annihilationist view of hell, to which I still hold, which successfully dealt with the existential problem I had with a God who would punish people for eternity [that’s not to say that this is the only reason I hold it], but I digress). I also had a relationship that fell through with a girl I had deep feelings for, showing me my need for God and stability outside of temporal, unstable human relationships. So, a combination of deep reflection and a sort of emotional crisis led me back to God. I would be utterly lying if I said that I haven’t had doubts. I’ve been deep into Christian philosophy, apologetics, and the like ever since and while the scales tip more and more in the side of Christian theism, I must admit that from time to time certain things trouble me. This should be expected when you investigate reasons for what you believe. My faith crisis was resolved mostly because of intellectual concerns. I don’t mean to downplay the emotional aspect, but for me, if there weren’t good reasons to believe that Christianity was true, I would eventually have to give up the faith; I simply could not stick with it. So the reason I am a Christian is because my experience of the world is consistent with Christianity and my belief is constantly confirmed through philosophical, historical, theological, and experiential means. Although I’ve got the intellectual aspect down, I still struggle with living consistently with my Christian worldview in my day-to-day activities. Because I am, as Paul said, one untimely born, not being raised in the faith, I definitely have trouble living the way I know I ought to strive to. My point here is that Christianity certainly isn’t easy or comfortable, and so my faith is not based on any sort of good feelings I get. My faith troubles me immensely at times, yet it provides a level of comfort on some level (just like the atheistic worldview, I’d imagine). *For more on how to share your story please visit Tell Us Why You’re a Christian.